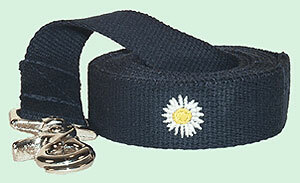 Cheerful cotton webbed lead repeats daisy design on the handle. Easy-to-use clasp is nickel plated. Blue, olive, red, or natural. Click here for matching collar.